I was finally able to get some good pics of my Strike Kit on stage. We had two gigs on Saturday, one just before noon and one that night. The morning gig was oudoors, so it made for some great pictures! Wow, beautiful setup. That's a kit worthy of showing off, for sure! I'm still surprised how large the kick drum is, really makes a difference in giving it a decent size and makes the drums more visible.. I bet most of the audience wouldn't even realize you're playing electronic and not an acoustic set. And still so clean! Or do you wipe down all the scuffs off the cymbals after every performance? (or just still so new it's not showing the marks yet). Looks amazing, Shawn. Thanks so much for the kind words, Alan! I have to say, that was probably the most impressive stage we've played on as a band. It's in a park, and the wall behind us is a memorial wall with nameplates for people whose names donations to fund the building of the park were made in. I love everything about the look of this kit, the kick drum being one of the best changes. The only downside to it is that I have to carry it separate from everything else, as it doesn't fit into the bag that I bought. But carrying it by using the stand as a handle works quite well. The hi-hat is still leaving a little to be desired. I am starting to have better luck with each gig, getting it dialed in a bit more each time. With this, I'm hoping to have the kinks worked out of it soon. I'm still under the impression that it's just a matter of getting the settings configured properly for the way I play, so I'm not ready to call it a complaint just yet. When we played the first of our five-show run three weeks ago, our former keyboard player came out to support us. He had joined the band right before I did, so he knew I played electronic, and he knew that it was the preference of the bandleader because of the volume control capabilities. Yet he said he still had to take a second look because he thought it was an acoustic set! Saturday marked shows four and five with the new kit, so I'm sure part of the lack of scuffs on the cymbals can be the new factor. I use them at home, too, though, so they've been used quite a bit, and they have taken a beating a couple of times! In particular, we tend to put a pretty intense closing section onto our cover of "Comfortably Numb," that has left me wondering if I went at them a bit too hard. I also have a tendency to be a little "cymbal-heavy" when I play, so I do use them quite a bit. I honestly think they have a better finish on them, though. They are definitely heavier than my DM10 cymbals. I'm compiling some footage from our "mini-tour" and hope to have some good video in the next few days. I'll share some of that once it's done. All in all, I couldn't be happier with the way this kit has performed on stage. It definitely has gotten a lot of attention. I've had multiple comments at each show I've used it in. I'd get the occasional comment about my DM10, but I think the overall bold look of the kit catches people's attention a lot faster. That's definitely not anything against my DM10. It's still my trusted practice kit, and I even carry the module with me as a backup. I've not done anything special to it in terms of appearance, so it's more functional than anything, but it has always served me well! Good looking setup Shawn. Don't you just hate the cables? I know I do on my kit. I use to have a hi hat stand like that one. I hated it. No heel plate. The pipe the module is on, did you add that or does that come with the Strike kit? Thanks! I'm pretty proud of it! It'll eventually get some modifications, but I'm happy with the stock look for now. I agree about the cables, though. I thought about trying to run them through the rack pipes, but I'm not sure if I'm crafty enough to make that work without compromising the stability of the rack. I have them strapped to the rack pretty tight, and when we first started our tour, there was very little extra slack in any of them, and it kept the kit a bit cleaner. I'll end up re-strapping everything, probably to the inside of the rack to hide them a bit better, before we hit the circuit again next month. Once you add in the cables from all of the other equipment, it looks like a total mess! I've gotten used to it. I've been using two of the Pearl single bass pedals with my double kick setup on my DM10 kit, so I was used to the way the pedal felt. I was a little apprehensive about the lack of the heel plate on the hi-hat stand, and it almost caused me to go a different route. I wanted matching pedals, so that would have meant giving up the Pearl double-kick also. I knew I liked the bass pedals, so I made a gamble on being able to adjust to the hi-hat pedal. It paid off for me, I really do like it. I know it all comes down to comfort and what works best for the individual, though. The short pipe the module is mounted on did come with the kit. I believe it comes with both the Strike and the Strike Pro (I'm pretty sure it was NOT in the expansion box for the Pro setup). It's actually shown as the mounting location for the module. I like it because it folds in and allows me an exit if I'm back toward a wall, which is usually the case in the places that we've been playing. I don't have to put quite as much thought into how I'm going to get out from behind the kit. I usually put my throne together first and build the kit around myself during setup. I've actually mirrored my DM10 kit to set up the same way. I have the snare pipe free since I bought a stand for my snare, and I keep the module mounted on it. I asked about the pipe as I had to add one to my DM10X rack.. I bought a very inexpensive no name electric kit for $50AUS. The reason I got it was so I had pipe bits along with their fittings (which fit the DM10 rack pipes) and I got some pads to play with. One of the fittings you can see in this shot of my kits.. On it have the top half of a snare drum stand and on that my laptop (which runs our backings). You can see why I asked about the cables. Definitely quite the rig, man! Interesting how you mounted the top of a snare stand, I'd have never thought of that. I bought a pretty cool laptop stand that fits nicely in with one of my jam setups.. Its a smaller surface area than a music stand.. I suppose the surface section with its pole could also slip nicely into a sidebar like that. What really caught my eye is your mic stand. I jam at four houses and we always have my drums pushed into a corner because space is tight. We usually try to squeeze a boom stand in behind me so I can swing it in and out above the hi-hat area but it can be really awkward. I never thought about finding a spot on the frame to rig up the upper part of a boom stand so I don't have a tripod jammed up in behind me. I have to totally agree, that's an impressive setup! I do like the fact that, with the Strike, you get the entire rack setup for the basic kit, then you get the rack pieces you need to convert it to the Pro. This consists of (if I'm remembering correctly) two additional leg posts with the mounts for the two additional crash cymbals (the basic rack has legs that are simply capped off) and two longer horizontal pipes to extend the sides of the kit out. This is to make room for the 14" floor tom, and I guess you get two in order to balance the other side out. I've not really had much need to mount anything on the side with the module. With the expansion, though, I still use the basic kit's short side bars. I'm able to angle the 14" tom so that it still fits, and, in my opinion, this helps the rack fold together a little better. I keep the cables attached so that when I set up and tear down, I don't have to do anything with cabling except connect to the pads and module. I really like how you connected your laptop and your mic. I don't have a need for the laptop at the moment, though, as I'm just using the Strike's built-in sounds. They are more than sufficient for what we do. I've also used the sampler for any extra bits that I've needed, so we don't do any kind of backing tracks. Doesn't mean that won't change in the future, though. And yes, I can definitely see why you mentioned the cables! Alan, Happy Birthday! Hope your day is great, even though you did go to work. Hopefully you can still make the most of it! I loved having my mic there.. But I noticed a problem with it.. 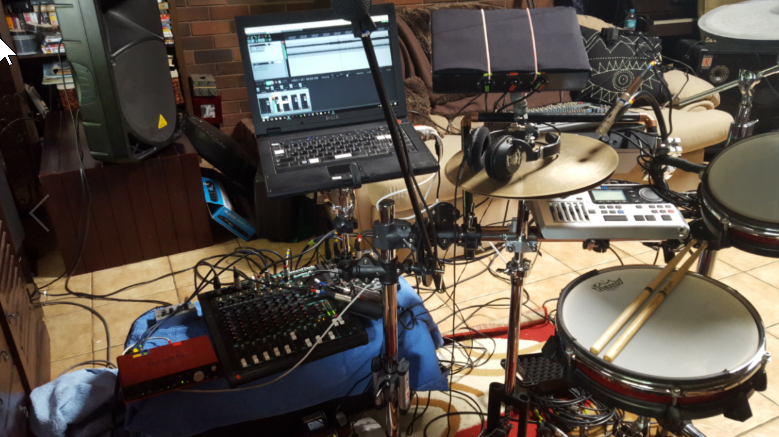 I was home one day and I had the Mic setup as I was helping my son was do some vocal recordings (and that is the only mic stand in the house).. What I noticed is that hitting the drums, transmitted the sounds into the mic!!!!! In the cans I could hear every thump.. Not just the sounds of the stick hitting the pads. It was every sound. Even if the hit the rack with the bottom of my fist, the mic picked it up. I have put in back on the stand. When setting up I put the rack down first, the and mic stand in next. It sits right behind where it is in this image but just behind the pipe. Maybe I will try again but add some rubber padding. This works really well.. The laptop just sits there.. Just a slight twist an I can lift it out.. I can't tighten the claws much at all. If it that the claws at the back start to spread apart.. So the laptop is just sort of sitting there, JUST held by the claws.. Despite that it is rock solid and never in fear of falling out . Is also out of the firing line, so it no fear of being knocked by me or a flailing drum stick. heck I was flailing drumsticks the other night!